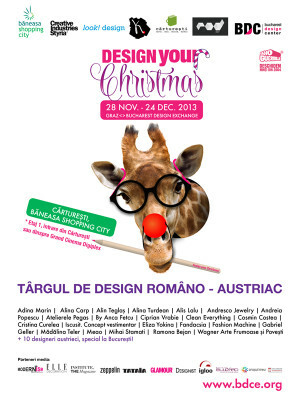 During the period 28 November to 24 December 2013, over 30 Romanian and Austrian designers, with special design objects and products for winter holidays will participate to a fair inside Carturesti store in Baneasa Shopping City (Entrance from Grand Cinema Digiplex). This is the first time in Romania when product designers community, encouraged by DESIGN CENTER BUCHAREST and Rod - Romanian Design (bookstore), together with the Austrian designers from the region of Styria - Graz are joining forces to bring to the Romanian public attention special items design: a proposal for a contemporary and fresh approach to Christmas shopping and presents specific period. At the Design Your Christmas Fair! you will find items - winter gifts, decorations, hand painted porcelain, precious metals inserts, objects decorated with various interpretations, Romanian contemporary lighting items for rooms with personality, authored extravagant jewelry, Romanian objects – hip accessories and items - such as bicycles Pegasus, whose image was recently refreshed by a novel designer or outfits - adjusted manually. Interested in visiting Bucharest? Book a hostel. "Design Your Christmas!" Fair in Bucharest. You can get here description, reviews, address, time and details of "Design Your Christmas!" Fair in Bucharest. Visit Bucharest Tips for more Fair events in Bucharest!